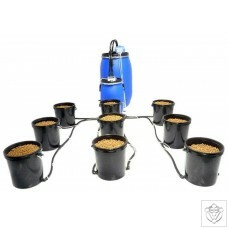 Designed specifically for growers who insist on growing ultra heavy yielding, large tree sized plants. Available in 6, 12 and 24 pod configurations. This new system is much more than just a multi-pod system on steroids! Our new system is a hybridisation of the proven Deep trough flood and drain technique, Deep water culture (the bubbler) and under water current, all in one! We have used much larger pipe and fittings combined with extremely powerful, adjustable 3000 litre per hour, high quality water pumps, very large 22 litre outer buckets and meshed bottom inner buckets. The systems come complete with clay pebbles, ultra powerful high quality air pumps, pre configured silicone tubing and air stones plus full assembly instructions. An hour of work and she’s ready to go hyper on your plants! 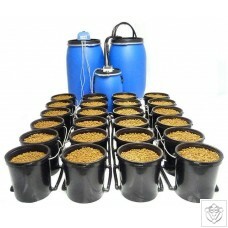 In a nutshell, this modular system retains approximately 4 inches of highly oxygenated bubbling nutrient solution in the bottom of each pod at all times, much like a Deep water culture system, but also has the added benefit of a very rapid flood and drain due to the oversized pipe work and high powered water pumps we have selected. The flood and drain cycle is achieved in a very rapid fashion indeed, quickly pushing stagnated air out of the roots of plants and sucking fresh oxygen rich air back into the roots. Due to the massive 22 litres of medium, we can also accomplish an even longer dry period than previous systems, allowing even more aeration to the roots of the plants. Another great feature of this system is that it has a built-in failsafe. In the very unlikely event of water pump failure, you will still have oxygen rich water bubbling away in the system to keep your plants flourishing, likewise if your air pump fails, which again, is very unlikely, you will still have the benefit of the flood and drain cycle, keeping your plants going strong. You truly get the best of both worlds here. Rapid flood bubble and drain! If you want the next level, Bentley of all hydroponic systems, then look no further - this is it!